Terry Baum in HICK: A Love Story. Photo by Lynne Fried. 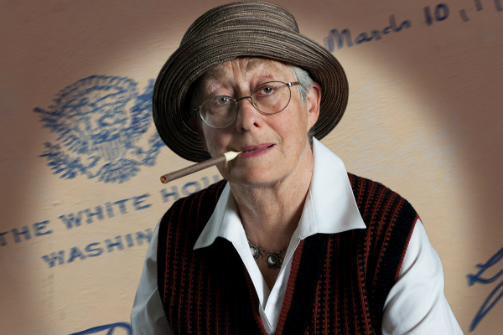 BOTTOM LINE: This honest and revealing one-woman show chronicles the 30-year relationship between journalist Lorena A. Hickok and First Lady Eleanor Roosevelt, exposing both the impact of internalized homophobia and the ways in which the women's not-so-secret affair was sustained and nurtured. The press called Lorena Hickok "rumpled, fat, and masculine," but to US First Lady Eleanor Roosevelt, "Hick" (well played by Terry Baum) was simply her darling. After ER's relationship with husband Franklin Delano Roosevelt became platonic, she struck up a friendship-turned-romance with Hickok, then a "gal reporter" covering the 1932 presidential election for the Associated Press. Hickok was a force, the first woman to have her byline on the front page of the New York Times and a well-respected journalist whose hard-hitting, pull-no-punches stories rivaled those of her male colleagues. Sassy and foul-mouthed—Baum reveals that Hickok could cuss like the best of them—she refused to kowtow to either bosses or social expectations. The pair met when Hickok was assigned to interview ER; she was immediately smitten. Already aware that she was drawn to women, Hickok did not dare to imagine that her feelings would be reciprocated. But they were. Terry Baum's performance as Hickok is exceptionally nuanced. At times she presents as a self-questioning "oddity" in a world of straight couples and heteronormativity. Then, almost inexplicably, the tables turn and she presents as bold, unapologetic, and forthright about both her professional and sexual identities. She and ER were very much in love, she confides. Despite being "as different as chalk and cheese," Hick notes that when they were together they functioned "like two violins vibrating in unison." It's a lovely depiction, aided by periodic voiceovers (read by the unseen Paula Barish) that reveal bits-and-pieces of the more than 2,300 letters—some of them explicitly romantic—that ER hand penned to Hick between 1932 and 1962. It's easy to relate to Hick as she swoons and smiles in recollection. As Hick's memories unfold the audience is asked to imagine numerous locales: Hick's New York City apartment, circa 1968; the Russian Tea Room where the pair had their first date; Yosemite National Park, where they vacationed; the White House; and the many places that Hick traveled as an employee of the Federal Relief Administration, a job she took after she left the AP. Since the play's set never changes—the stage remains bare save for a chair, coat rack, manual typewriter, and corded black telephone perched atop a small table—Hick is the focal point of the show. It's her story, nostalgic and tender. Still, beyond the personal are larger political concerns and writer/actor Baum says that she conceived HICK: A Love Story as a counterbalance to the refusal of filmmaker Ken Burns (creator of the PBS series, The Roosevelts: An Intimate History) and historian Doris Kearns Goodwin (author of No Ordinary Time: Franklin & Eleanor Roosevelt) to include Hickok in accounts of ER's life. As she told Gay City News in early August, "Hick mentored Eleanor in her relationship to the press and many of Eleanor's ideas were actually Hick's ideas...Hick was instrumental in teaching Eleanor how to utilize the media and get her message out...They had a wonderful, playful relationship." Indeed. HICK: A Love Story celebrates their union, capturing the humor, tension, and pathos that characterized the relationship. The historical record has been corrected.